So far, 49209 people have contacted their printer manufacturers to complain. Follow our instructions and be the next. Our work is having an effect! This request by European Parliament member Satu Hassi has resulted in a response by the European Commission that suggests that tracking dots may be a human rights violation. The initial request references and builds off the work of people who have responded to this site. Join us, call your printer manufacturer, and help today! 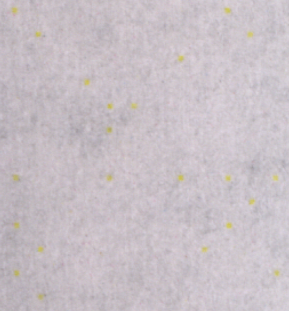 When you print on a color laser printer, it's likely that you are also printing a pattern of invisible yellow dots. These marks exist to allow the printer companies and governments to track and identify you -- presumably as a way to combat money counterfeiting. When one person asked his printer manufacturer about turning off the tracking dots, Secret Service agents showed up at his door several days later. Let's stand up to silent tracking and government bullying and send a strong message to printer manufacturers. Our privacy and our control over our own technology is far too important to give up over trumped up fears of photocopied money. Get informed about the issue! Spread the word. Tell your friends and coworkers. Follow our instructions and call up your printer maker. Ask them to stop using tracking codes and demand that they tell you how to turn it off. The Secret Service can't come and question all of us! Support groups like the EFF working to expose and oppose printer tracking dots. Most color laser printers made and sold today intentionally add invisible information to make it easier to determine where (and when) a particular document was printed. This seems to have been done as part of a secret deal between the United States Secret Service and the individual manufacturers. Some of the manufacturers have mentioned the existence of the tracking information in their documentation, and others haven't. None of them have explained exactly how it works or what information is conveyed. No law requires printer companies to help track printer users this way, and no law prevents them from stopping this practice or giving customers a solution to avoid being tracked. This information is most famously known to be coded by patterns of yellow dots that the printers add to the background of all the pages they print. The yellow dots are hard to see with the naked eye, but can be seen under bright blue light or with a microscope. Their arrangement reveals which printer was used to print a particular document, and sometimes also shows when it was printed. Some of the codes have been understood while others are still mysterious, but none of the printer manufacturers has denied that the dots are intended to help track a particular document to a particular printer (or that they can actually be used for this purpose). This is a direct attack on the privacy of the owners and users of printers, and in particular, on their right to free, anonymous speech. Printer companies still seem to be unaware that their customers are concerned about this attack on privacy. We'd like to change that by encouraging the public to call in and ask how to disable the tracking. Hopefully, some of the manufacturers will be willing to do the right thing for their customers and make a solution available to stop the tracking. Tracking dots are usually invisible to the naked eye under normal light. They are tiny and light yellow which makes them hard to see against the white of a page. They are usually printed across the entirely of a page -- even the parts where that are otherwise blank. They are present in both color printers and copiers but do not show up in pages printed in black-and-white mode. The best way to see them is by using an intense blue LED in a darkened room. You can frequently find appropriate blue LEDs as keychain mini-flashlights. You can also see them simply by using a high resolution flatbed scanner. The images below were scanned at 600dpi. Zooming in should reveal the yellow dots when they are present. To make them more clear, you can use photo manipulation software (like the freely available GIMP or Adobe Photoshop) to show only the blue channel of the image where the dots will be more visible. 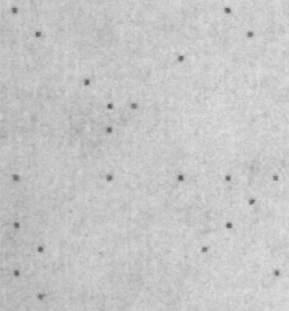 Sample closeup of printer dots on a normal printed page. Sample closeup of the same dots showing only the blue channels to make the dots more visible. Since this site was originally launched, some people have written some software to help automate the process of seeing these dots. DotSpotter Web is a website that allows users to upload scanned version of pages and which can often reveal the hidden tracking dots. Different printer manufacturers use different patterns of dots so your tracking dots might appear different than those in these pictures. For more information about the printer dots, a lists of affected printers, and information on what you can do about it, see below. Above all, spread the word. The only thing worse than tracking dots in people's print outs are tracking dots in their print outs that they don't even know about it. If people know about the tracking dots, they can choose to print in black and white or on dot-matrix printers when they feel the need to remain anonymous. It's not fair to ask people to have to choose between color printing and their privacy but it's better that they make the correct choice than to assume that they have privacy when they don't. Most important of all, people won't stand up to their printer makers and the governments unless they know! Spread the word and call your manufacturer today!